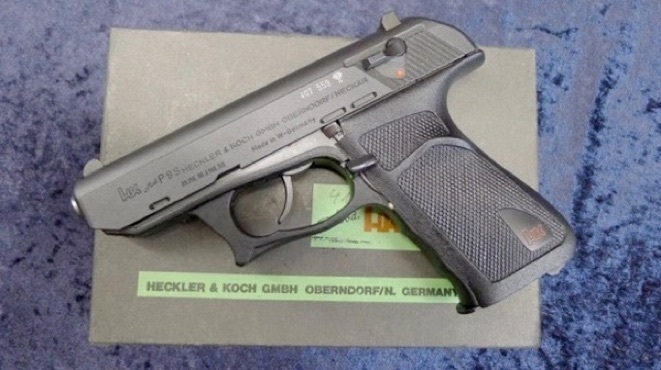 The HK P9S was one of the milestones in HK pistol design. You can find great information on HK Pro, so we will not get into the details of the history of the P9. Following are the steps needed to check and replace the buffer in the P9S, followed by a review of the P9S. We have now P9S grip screws in stock! Click here form more information. 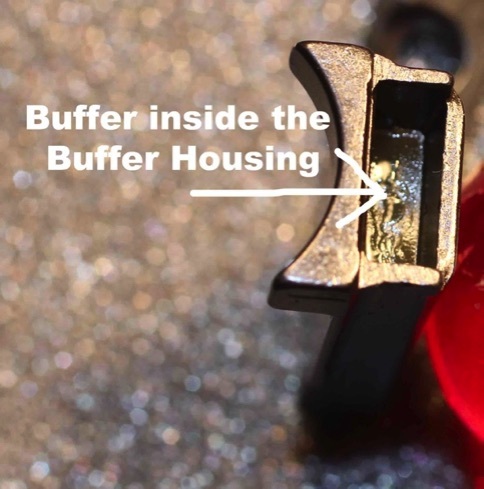 How to check and replace the buffer. It is very important to check the buffer before you fire your P9S. 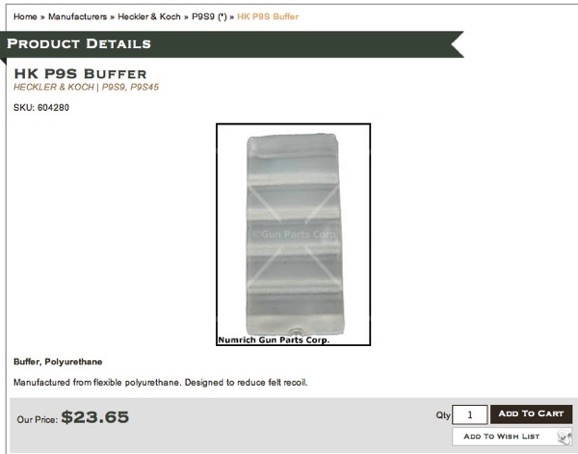 This buffer is made out of “Polyurethane”, a degradable plastic. 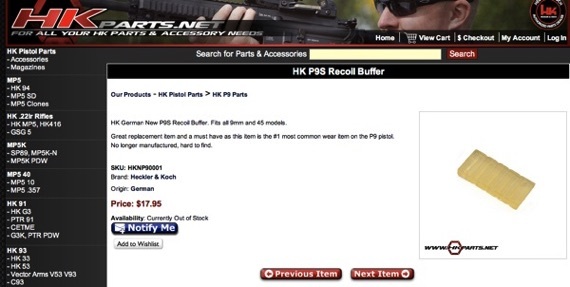 HK recommends replacing it every 5.000 rounds. Over time, oil and cleaning solvents will erode the buffer long before. I check on my P9S the buffer every 1.200-1.500 rounds or every other year. If the buffer is not replaced in time, the pistol will be damaged and a repair might not be possible. The buffer itself can be bought from vendors like Numrich or HKPart.net. Click on the pictures below to get to the vendors site. Please read all instructions first and then start with the pistol. 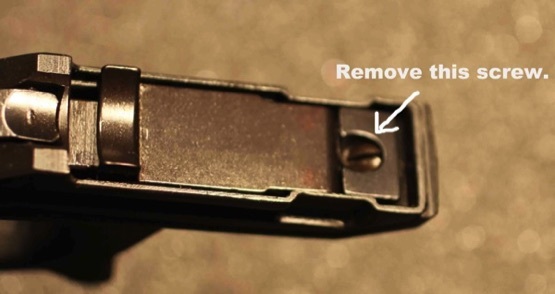 First make sure the P9S is not loaded by first pushing the safety lever into the safe position (you see the white dot) and then removing the magazine. Now pull the slide back while still pointing the pistol at all times in a safe direction. After assuring that the chamber is clear of ammunition, let the slide forward. Push the safety lever to the fire position, and while pulling the slide backwards just a little bit, press the disabling lever (that is not the trigger!) in the front of the trigger guard. Release the slide, and push it forward. Remove the screw shown in the picture. 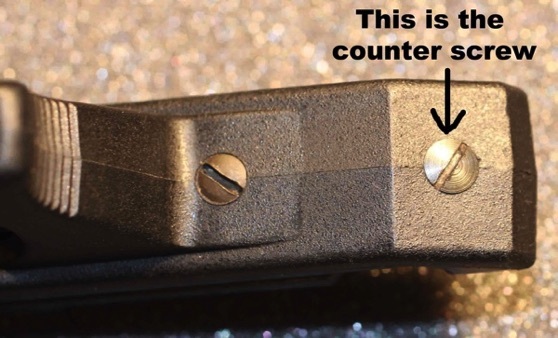 On the outside is the counter screw shown in the picture below. Make sure to counter it when removing the screw. 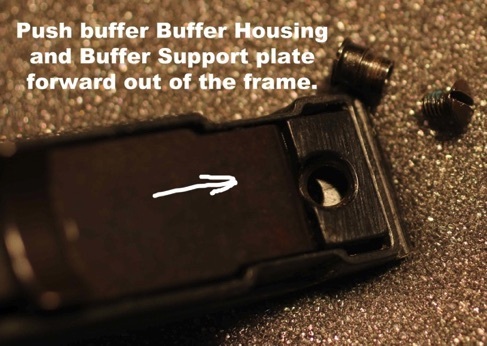 Now push the buffer housing and support plate in shooting direction out of the frame. While these parts are sometimes due to dirt hard to remove, use a screw driver with highest digression. Also push first the support plate out, which needs to be lifted in the front to get over the frame of the pistol. Here are all the parts out of the pistol. As you can see on the inside screw, a little blue screw glue will help that the screw does not get loose or even lost during shooting. 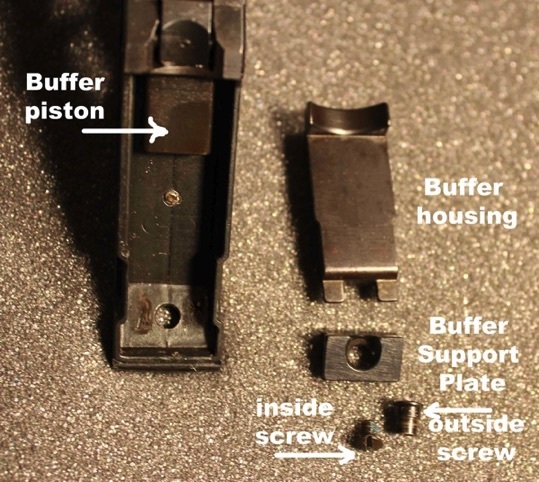 When cleaning the pistol, it is a good practice to make sure the screw is tight. That is how the buffer should look. After you checked it, assemble the pistol in the reverse order.